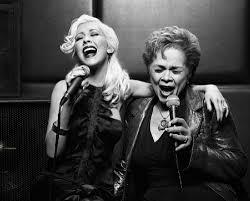 RETRO KIMMER'S BLOG: ETTA JAMES AND CHRISTINA AGUILERA! Christina Aquilera idolized Etta James and emulated her as she was growing up. Even to the point of the enunciation of every note... definitely a big time fan.